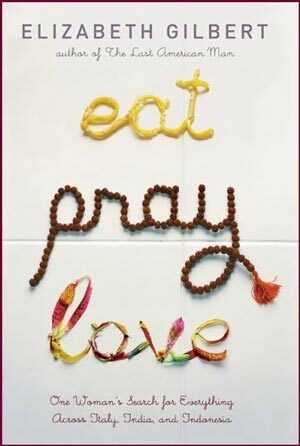 Eat, Pray, Love was not one of the books I specifically had in mind to read this month. In fact, until recently it wasn’t a book I ever intended to read–but the positive reviews of Committed at Tales from the Reading Room and Of Books and Bicycles made me curious, so I put holds on the digital copies of both of Gilbert’s books at the public library and lo and behold, this weekend, just as I was despairing at the difficulty of reading Christina Stead’s The Man Who Loved Children, I got to the head of the queue for Eat, Pray, Love. Rescued! Because after all, I own The Man Who Loved Children, so there’s no rush there, whereas Eat, Pray, Love will expire on my Sony Reader in just a few (well, about 12) more days! So I simply had to put everything else aside and read it. Right? And you know, the thing that surprised me (because of various prejudices I had going into this) is that once I’d started reading it, I really did want to put other things aside and keep going. One reason is that Gilbert makes the reading so easy: her prose is lively, conversational, personal, colloquial. It’s also full of vivid details, entertaining anecdotes, and genuinely funny quips–for some reason I didn’t expect the book to be quite so funny, but for the first time in a while (since Miss Pettigrew Lives for a Day, I think) I was chortling merrily through a book, which actually was a nice change after all the gloomy Catholics and grim police inspectors I’ve been hanging out with this term. La Vendée is no laughing matter either, and as for Agnes Grey, which I whisked through last week–why, the kid who likes to torture baby birds is delightfully cheering, really! To be sure, there is some serious stuff in Eat, Pray, Love. Gilbert’s struggles with divorce and depression are not, in themselves, funny at all, and though I had trouble taking Gilbert’s spiritual quests and episodes of transcendence quite as seriously as she does, they too are not intrinsically comical. But Gilbert has a gift for finding the irony or just the plain old silliness in any situation, and she relates even her most profound spiritual experiences with enough self-deprecation and unpretentiousness that it didn’t matter much to me that much of what she said about religion was pretty much all feel-good evasions and platitudes. It’s not altogether complimentary, of course, for me to say that I basically gave the book a pass on this because it was fun to read. Usually I’m more stringent than that! So why aren’t I railing at Gilbert for peddling comfortable truisms? I did do a little rueful head-shaking, but mostly I just moved on to the next “good” part, mainly because Gilbert is really just talking about herself, and she seems perfectly sincere. She comes across as someone who is smart but kind of flaky, and the book–which is a memoir, after all, not a a treatise, not even really a self-help book (since she’s too smart to insist that what worked for her will work for anyone else)–speaks in her voice and tells her story. She is who she is, so the book is what it is. But that doesn’t quite do justice to the book: it sounds more condescending than I think is altogether fair. Though the book is not a deep intellectual or philosophical exploration of the meaning of life in general, I did find it unexpectedly thought-provoking about life more particularly. In her review of Committed, litlove remarked that the book “makes you consider your own life, and those of the friends and family around you. Her vivid emotional honesty encourages you to look clear-sightedly at yourself, and the range of information she provides, as well as the stories she tells, provide a rich tapestry of experiences against which to measure your own.” I haven’t read Committed yet (I’m still in the queue!) but this description really fits Eat, Pray, Love as well. For instance, Gilbert talks about her (first) marriage and her reasons for finally leaving it in terms that probe the nature of the demands and expectations of marriage and family (an encouraging sign for Committed, which obviously continues these themes). I doubt that anyone who is or has been married can read someone else’s frank analysis of their own relationship without holding the mirror up to themselves. But some of the more abstract issues that arise as Gilbert makes her own voyage of self-discovery and self-affirmation were ultimately the most interesting to me. …I always thought we only had two choices in our lives when it came to pizza crust–thin and crispy, or thick and doughy. How was I to have known there could be a crust in this world that was thin and doughy? Holy of holies! Thin, doughy, strong, gummy, yumy, chewy, salty, pizza paradise. On top, there is a sweet tomato sauce that foams up all bubbly and creamy when it melts the fresh buffalo mozzarella, and the one sprig of basil in the middle of the whole deal somehow infuses the entire pizza with herbal radiance, much the same way one shimmering movie star in the middle of a party brings a high contact of glamour to everyone around her. . . . really, the pizza is so good we can barely cope. It’s pasta, but a shape of pasta I’ve never before seen–big, fresh, sheets of pasta folded ravioli-like into the shape…of the pope’s hat, stuffed with a hot, aromatic puree of crustaceans and octopus and squid, served tossed like a hot salad with fresh cockles and strips of julienned vegetables, all swimming in an olivey, oceany broth. I was less convinced by her yogic experiences–or I guess I should say, since I can hardly dispute her experiences, by their underlying philosophy of acceptance. Gilbert talks a lot about her battle to overcome discontent and dissatisfaction, and she can be eloquent or, again, very funny about the damaging effects of these negative emotions on her life and her relationships. But there’s a fundamental passivity in all that embracing the wrongs and the injustices and the hurts and the insults and the failings–letting them into your heart and just living with them, or letting go of them. At a difficult time in my own life, someone recommended the book Full Catastrophe Living, which preaches a similar philosophy. But what if you don’t want to accept the things that are wrong, but rather to change them? to fight against them? I’ve long been a believer in the importance of dissatisfaction: it drives political change and social transformation, after all! Without people who refused to accept things the way they were–well, we can all put together a catalogue of the advances in social justice that would never have been made. Isn’t something similar true at a personal level? Acceptance may be the path to mental quiet, but it has always seemed to me the path, also, at least potentially, to self-suppression (which is, I suppose, actually the point), and also, again at least potentially, to unacceptable levels of self-sacrifice. It’s just not an ethos I can embrace. As a consequence, I have not found lasting mental quiet, and I continue to struggle against and complain about and be dissatisfied with some aspects of my life that I may ultimately never be able to change–or maybe I shouldn’t even aspire to change, who knows. Of course I’m always conscious that all things considered, I have it pretty good (I must say that seems especially true in a week full of overwhelmingly bad news from all corners of the globe). So I often feel guilty about my own mental chafing (meta-self-criticism! ), and I wondered, as I read Gilbert’s rapturous accounts of learning meditation (and of the aftermath, in which she is both happier and, of course, much prettier) whether I should go down that road and seek contentment and inner peace through acceptance. I still have Full Catastrophe Living, after all. Gilbert isn’t really that specific, though, about the long-term benefits, or even about the real-world implications of her training. Maybe Committed will clarify for me what learning to just live with (or even embrace) life’s imperfections and disappointments means for her in practice. How do you find the balance between that acceptance and standing up for what you (or others) want, need, or deserve? So that’s eating, and praying. The final part of the book is, of course, about loving–including her eventual abandoment of that vow of celibacy. Though I found her account of life in Bali as lively and entertaining as the rest of the book (at least, the rest of the travel and eating parts), the happy romantic conclusion seemed pretty pat to me. If it were a novel, I would have been disappointed at the descent into cliché, and at the way yet another story ostensibly about a woman’s self-discovery ends with her finding Mr Right. But I guess it really happened that way! And in the end, it doesn’t much change my overall response to the book. It made me laugh and it made me think. Both are good things in a book! *For some interesting comments about Eat, Pray, Love as an example of “priv lit,” see these posts from zunguzungu and MillicentandCarlaFran about the film adaptation. I haven’t looked into the wider debate they reference–but I did follow up the link in the comments to Historiann’s post “Selfish! Selfish! Selfish!” which is well worth a read in this context. I like your doubts on acceptance. And I lost any taste for reading this book when I heard that her book-themed jewelry is sold on TV? I like your description of the Italy part. Having been to Italy a few times, I think there really is something to be considered in being able to take pleasure (in food as in other things) despite all the difficulties surrounding you. Does the recognition that things are bad really need to infuse every aspect of our lives? Maybe there is something similar in the yogic part. I really like the work of @havi Brooks (http://www.fluentself.com) and I can see how that accepting where you are thing seems to be about self suppression. But I also see that it makes for a good starting point for affecting change. Accepting where you are does not mean accepting that you have to stay there. It’s been ages since I read Eat, Pray, Love–I think I read it when the hype was at its height, so I couldn’t help but be a little disappointed in it, but I did find parts of it quite entertaining. And yes, the ending was annoyingly pat, but if that’s what happened, that’s what happened–and so it didn’t bother me. I’m really interested in what you say about her yogic experiences. I don’t practice yoga myself (at least not in the spiritual sense, I do some of the stretches, and I dabble in Christian contemplative meditation), but I do see the value in the whole idea of acceptance. For me, it’s not necessarily about accepting every injustice or everything about myself I need to improve, though. It’s more about accepting my limitations and learning to live within them, to figure out what I have some hope of changing, given my situation, temperament, and abilities. Shelley: That does sound tacky, but then, is it fair to resent people for making the most of their success? Maybe the profits will free her up to write whatever she wants next time around. Teresa and Jo, good points about what ‘acceptance’ might mean in practice. Hey Ro! Sarah and I rarely (read “only once”) go to movies together anymore.. but we went to this one. It left me with some jealousy that there are those who are so free they can still search the earth for themselves. I also came away with some recognition that living the life you have is a noble adventure. And the romance part….definately improved by the many good qualities of her leading man! Ps. I like to read you! Hi, Liz! Nice to know you are out there reading…. I think I’ll probably rent the movie soon. One reason is just to bask in what is probably some really beautiful scenery! By this point in our long winter (when the light is bright enough for spring but it’s still cold and everything is still stripped bare) my eyes are hungry for colour. Your points about acceptance are interesting. Your questions about the dangers of passivity are ones I’ve had too, and I’m not sure how to reconcile them with the beliefs I have that are similar to Gilbert’s. I think it’s important to see things as they are and to accept that things are as they are right in this moment, but that doesn’t mean they can’t be changed. I think it means trying to change the things that are wrong, but living with and accepting the consequences, even if failure is involved. For me, it’s about awareness through the whole process, no matter what happens.